A Xinhua News Agency blog by an employee calling himself “just one of the Party’s dogs,” has gone viral in Chinese cyberspace. 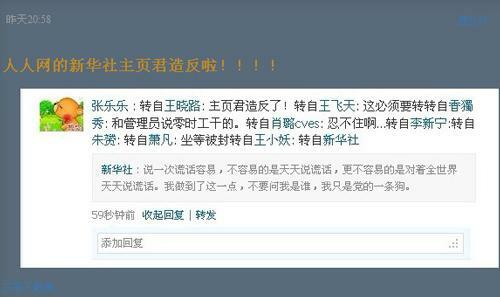 The frank admission has caused a storm in Chinese cyberspace. As soon as the blog appeared, it was copied and quoted widely, Sound of Hope (SOH) Radio reported. The post was quickly silenced and Xinhua’s entry on Renren taken down, SOH said. The Chinese Communist Party (CCP) created Xinhua in the 1930s to spread its revolutionary propaganda. It is still run by the Chinese regime and has grown into a multimedia empire with offices throughout the world. It’s not a secret that Xinhua is the CCP’s mouthpiece, and often shapes and fabricates news to fit the regime’s needs. Mark Newham, a British freelance reporter, worked a year at Xinhua’s headquarters in Beijing in 2004. In his book “Limp Pigs and the Five-Ring Circus,” published this year, he depicts the experience, saying he considers Xinhua the center of the CCP’s propaganda machine. Renowned Chinese economist He Qinglian told SOH that any official media in China, from the day it is born, serves only one purpose: to be the Party’s mouthpiece. It is supervised by the CCP, and the purpose of its reports is to lavish praise on the CCP’s work and policies. Xinhua is also known to have links to China’s intelligence services, Michel Juneau-Katsuya, a former senior intelligence official with CSIS told The Canadian Press. “Basically, it’s a cover. We’re not talking about just people collaborating with the intelligence services. We’re talking about people trained as intelligence officers to operate in foreign countries,” he said.